The Movie Mind comes from a recent generation with the thinking that different does not equate to bad, and that we are in no position to criticize others or tell them how to live. Now that may sound slightly hypocritical, being as how most of what I do is criticize anything on a television or movie screen, but when you’re doing it for entertainment and for money, you are fair game. Besides, this movie turns out to more hypocritical then The Movie Mind could ever try to be. Now that the table is set, I don’t feel the need to get into the morality, or lack-thereof according to some, any further. The movie does plenty of that. 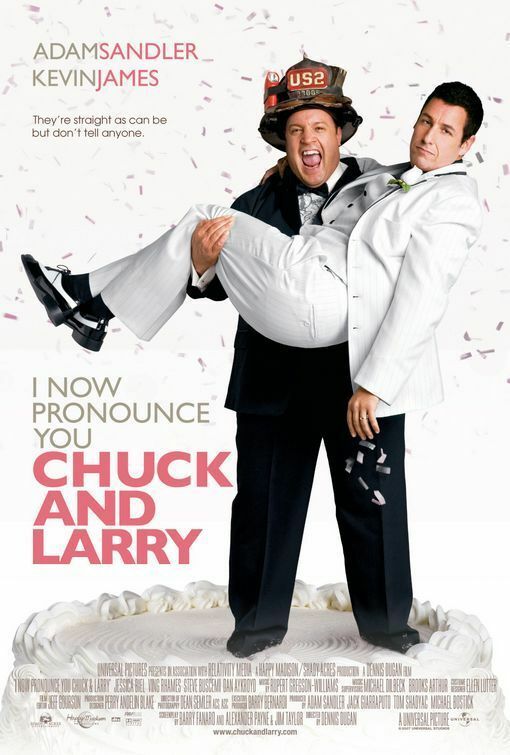 Chuck and Larry takes your standard Sandler comedy, which I love as much as the next guy, except mixes in a heavy dose of finger wagging and shame-on-you lectures from the writers, which is too overbearing and turns this movie into a fight between a moral lesson and old jokes at the expense of gay people. Sandler plays a role a little more crass then his typical loveable dufus part, but manages to wind up there in the end. Kevin James, as his best-friend turned husband, puts in a decent performance, and there some good throw-in roles by some other actors outside the usual Sandler crew of buddies. Steve Buscemei just commands your attention, no matter how shallow, or silly his role in a movie is. I can’t get enough of that guy under any circumstance. Jessica Biel’s token hot-chick role provides a bigger lesson about gay guys then the main plot. Pretending to be gay gets you so much more than better government benefits, as she shows with her comfort level and trust of Sandler while he is “undercover”. Outside of my issues with tone of this movie, which feels a lot like the tone of Dogma, only this time tackling a specific moral issue within religion, there are plenty of other reasons to be disappointed. The whole premise is based on the fact that James’ character cannot change the beneficiary designation on his benefits from his late wife to anyone else. If that is what the writers think the law allows, then maybe that is why they are all currently on strike. Anyone with a job knows you can change your beneficiary anytime. You may not be able to change your actual benefits outside of an open enrollment date, but you and I can go and change a beneficiary anytime we want. Not to mention a thing called “secondary beneficiaries”, which would automatically be his kids if his wife had passed away. Now that you have received more of a human resources and health coverage lesson then you ever dreamed of having when you started reading The Movie Mind reviews, consider this your lucky day. There will be no charge. I felt the need to teach a useful lesson out of this movie instead of just jamming my moral beliefs down your throat, much like the writers of Chuck and Larry do to us. I am still wondering how this movie gets away with trying to make a moral point by saying that gays are people too, and deserve our respect the same way a straight person does, yet at the same time goes out of its way to make every clichéd joke at the expense of gays every chance it gets. It doesn’t get much more hypocritical than that. The “moral lesson” this movie throws at you is either one you know and understand already, or one you’re not going to understand. Either way, there is no use trying to change someone’s view on a volatile issue such as gay rights if half the time you are making the same jokes they have a problem with anyway. You can try to look at it that they are trying to make light of the issue by having the audience laugh at the absurdity of the anti-gay view, but if so, it failed drastically. I say shame on the writers for throwing a half-hearted attempt at a life-lesson in our faces, only to coat it with lame jokes throughout.